• Authorized to maintain the athletic co-op with South Holt for football and track during 2019-20. • Approved the annual membership into Missouri Educators United Health Plan with the carrier being Cigna and Forrest T. Jones as the third party agent. It was also authorized to increase the employee monthly cost of $5 to the premium for 2019-20. • Accepted the Morenet Circuit agreement and the Simplified Online Communication System, Lincoln, NE, for three years at $1,900 yearly. • Set the reorganization board meeting for 7 pm, Wednesday, April 10. • Accepted the resignation letters from Carla Taylor and Kate Miro for end of the school year. Elementary Principal Shawn Emerson told the kindergarten roundup will be from 6 to 7:30 pm, Tuesday, April 2; the 275 Spelling Bee is set for April 3; and another Parents as Teachers event will be on April 17. 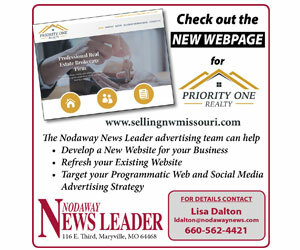 Secondary Principal Michael Hollingsworth reported 39 high school and 17 junior high students made the high honor roll, Tillie Stanton is among the Missouri Scholars 100 and the first varsity track meet was set for March 26. Superintendent Jeff Blackford focused on pending legislation, a grant for new salad bars and the calendar update due to snow days. During closed session, the board hired all certified personnel.